Search.genieo.com – How to remove? Search.genieo.com is considered to be a malicious browser hijacker, which can also be classified as a PUP (potentially unwanted program). It is developed by Genieo, which is known for creating malware. 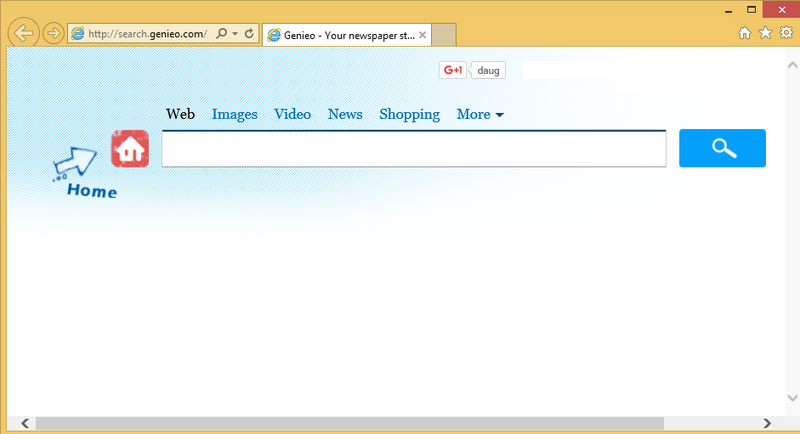 What the hijacker basically does is changing your default homepage and search engine into Search.genieo.com. We are sure that the change has been implemented without your consent – this is a very usual case for browser hijackers. Hijackers like this are a threat because a wide variety of malware and viruses can come into your system with their help. Unfortunately, this suspicious search engine may seem useful for some users. When you open the page, you can see that the engine tries to look useful by putting a bunch of search tools at the top of the page. They include Images, News, Shopping, and others. Actually, the News section leads users into Google news results, and the Shopping tool opens savefront.com. Redirections like this are always suspicious because you may never know in which sponsored site you might end up. It is better to remove Search.genieo.com before you get into trouble. Why can Search.genieo.com be dangerous? Well, first of all, Search Genieo is not intended to help its users. It actually uses them to earn money by displaying a huge amount of ads while they browse. Even when you open its homepage you can see an enormous pop-up advertisement under the search bar. Later on, it is possible that you encounter other pop-ups, banners, in-text ads, and coupons. You may think that clicking on them may not be dangerous but the reality is different: even one click can infect your computer with malware if the website is malicious. Furthermore, the search results will not satisfy you. The engine can display third-party ads at the top of the page. They will look like legitimate results but will lead to unknown websites. In this way, it is possible to experience a PC infection or a loss of personal information. Uninstall Search.genieo.com now and don’t let this happen. How does Search.genieo.com infect computers? This browser hijacker comes bundled with other programs. Usually, the freeware and shareware that you download from unknown sites contains such Potentially Unwanted Programs, and that’s why it is essential to be really careful during their installation process. In many cases, you can see that the PUPs are actually listed and it is important to uncheck their check-boxes. To be true, it is best not to download software from suspicious sites at all and delete Search.genieo.com and other PUPs as soon as you notice their presence. How to remove Search.genieo.com from my PC? You can uninstall such browser hijackers and other PUPs from your PC either manually or automatically. Automatic Search.genieo.com removal is recommended because a good anti-spyware tool like Wipersoft not only will delete the hijacker, but also other malware that may be hiding in your PC system. Manual Search.genieo.com removal is possible if you are really familiar with computers but it carries a risk – you won’t be able to detect and uninstall other malware. That’s why investing in a good anti-malware and anti-spyware program is a good idea.